The indicator light is located inside the soap container and is visible through the window when illuminated. When moving the dispenser, turn the unit off, or avoid grasping the unit near the sensor area to prevent accidental dispensing of soap. If the following troubleshooting tips do not correct issues with this product, call 1-800-4KOHLER for further assistance. The sensor area is obstructed by soap residue. Turn the unit off and wipe the sensor with a clean, soft, damp cloth. The batteries are not installed correctly. Install the batteries properly. Refer to "Changing the Batteries." The batteries are dead. Replace the batteries. Refer to "Changing the Batteries." The batteries are not installed. Replace the batteries. Refer to "Changing the Batteries." The dial is in the OFF position. Turn the dial to your soap type and desired volume. The user's hand is too far away from the sensor. Place your hand within 2-1/2" (64 mm) below the sensor. For best results, hold your hand flat. Lighting conditions near the dispenser are interfering with the sensor. Move the dispenser to a different location, avoiding highly reflective surfaces and direct sunlight. Attempted to trigger the sensor using a dark colored dish cloth or sponge. Activate the sensor using a light colored dish cloth, sponge, or by hand. The unit needs to be primed. 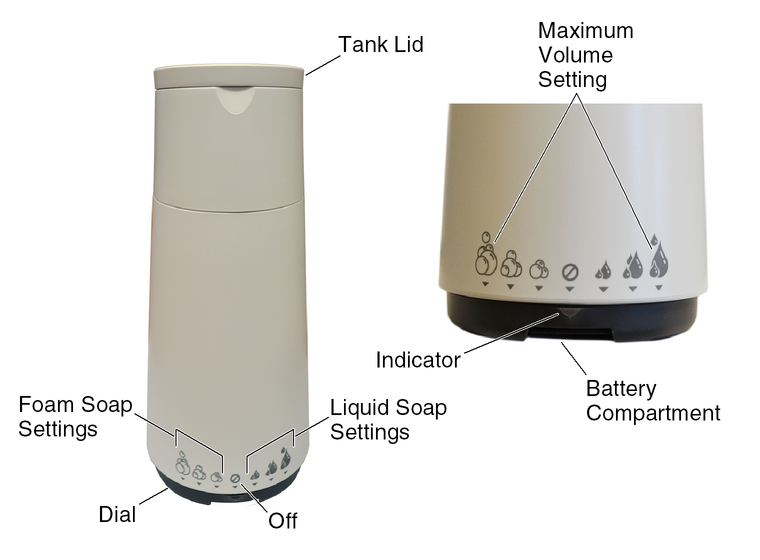 When starting with an empty tank, or if the unit has not been used for an extended period, the dispenser may need to be cycled up to eight times before soap will flow through the system. Trigger the sensor until soap is dispensed. The soap contains microbeads, exfoliants, salts, or other granular elements, which will not work with this dispenser. Flush the beads or granules from the unit. Refer to "Cleaning the Dispenser." The nozzle is clogged. Clean the nozzle. Refer to "Cleaning the Nozzle." Most shampoos and body washes will not work with this dispenser. Some brands of liquid soaps may not flow through the nozzle. Flush the soap from the unit. Refer to "Cleaning the Dispenser." The dispenser is clogged with dried soap particles. Clean the dispenser. Refer to "Cleaning the Dispenser." Foaming soap is being dispensed with a liquid soap setting. Turn the dial to select the desired foaming soap volume. This will activate the air pump to create foam. The dispenser contains liquid soap, which will not foam unless it is diluted with water. Dilute the liquid soap (approximately three parts water to one part soap), or drain the container and refill with pre-mixed foaming soap. TIP: The soap tank holds about 1 cup (0.25 L) of soap. NOTE: Dispensing volumes may vary from one soap to another. The volume setting is higher or lower than needed. The dispenser offers three volume settings for each type of soap. Turn the dial to a different volume setting. Refer to the "Product Features" diagram. The tab on the nozzle is not orientated properly. Position the tab on the nozzle so it points toward you. Refer to "Cleaning the Nozzle." The indicator light pulses for 20 seconds when the battery power is low. Replace the batteries when performance diminishes. Refer to "Changing the Batteries." The indicator light flashes for 5 seconds and will not dispense soap. Replace the batteries. Refer to "Changing the Batteries." The soap mixture is too watery. Add extra soap to the tank. Hold the lid closed while turning the unit over several times to mix. It may require several cycles to work the watery soap through the unit. The soap mixture is too thick. Add extra water to the tank. Hold the lid closed while turning the unit over several times to mix. It may require several cycles to work the thicker soap through the unit. Lighting conditions near the dispenser are triggering the sensor. Move the dispenser to a different location, avoiding highly reflective surfaces and direct sunlight. Soap or foam is hanging from the nozzle or sensor area. Turn the unit off, and remove any excess soap from the nozzle and sensor area with a clean, soft, damp cloth. Remove the cover from the battery compartment on the bottom of the dispenser. TIP: To open the battery compartment, use a coin to pry the cover open with a slight twisting motion. Install four AAA batteries, oriented according to the markings on the compartment. NOTE: If the nozzle is lost or becomes damaged, replace with service kit 1285212. Rinse the nozzle with water. Soak as needed. Reinstall the nozzle with the tab pointed toward you. Open the lid, and empty the tank. Rinse the tank with water, and empty. Remove and clean the nozzle. Refer to "Cleaning the Nozzle." Trigger the sensor repeatedly to dispense any remaining soap in the line. Add approximately one ounce of water to the tank to rinse any remaining particles. NOTE: For stubborn residue, use rubbing alcohol instead of water. 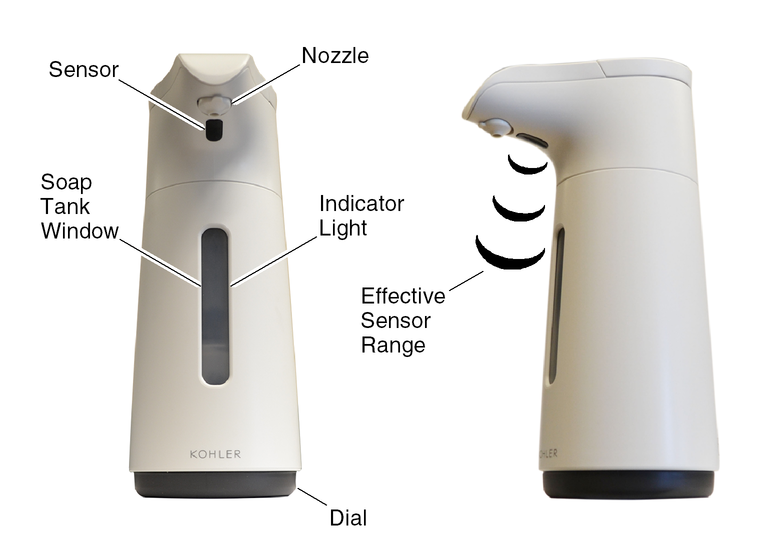 Trigger the sensor repeatedly to flush the remaining water or alcohol from the unit. Fill the container with soap without beads or other particles. Turn the dial to the desired soap type and volume. Prime the unit by triggering the sensor up to eight times, or until soap is dispensed. TIP: The soap tank holds approximately 1 cup (0.25 L) of soap. Foaming soap can be created by mixing one part liquid soap with three parts water. Clean the dispenser with a wet, soapy cloth. Remove excess soap immediately, as it can cause rusting. To remove rust or hard water spots, consider using a cleaner such as Bar Keeper's Friend®, MORE Spray and Foam Cleaner. Avoid using cleaners with chlorides (bleach). Using cleaners with chlorides (bleach) can rust stainless steel.